A custom embroidered logo hat in Burnt orange with adjustable strap. The strap to adjust it is cloth and tucks back inside itself for a clean look. The weathered orange & white logo really pop as seen in the pictures. ONE ~ Orange handmade Journal 3.5"x5.5" with fountain pen friendly paper. Using Cane Fields sugarcane 20b. 93 bright white paper. Each journal has 30 pages & is stamped with the Fountain Pen Day logo on the front bottom right corner and full logo stamped on the back. 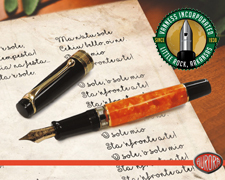 ONE ~ Limited Edition Fountain Pen Day Pen Show pin. ONE ~ Standard version pin.